A maximum of 60 light poles are available on The BLVD, between Beech Avenue and Genoa Avenue, for 2014/2015. The banners will display pictures of Antelope Valley residents who have served in a combat theater during a time of war. LANCASTER– Help celebrate local military heroes by nominating them to be featured on banners prominently displayed along The BLVD for up to one year. 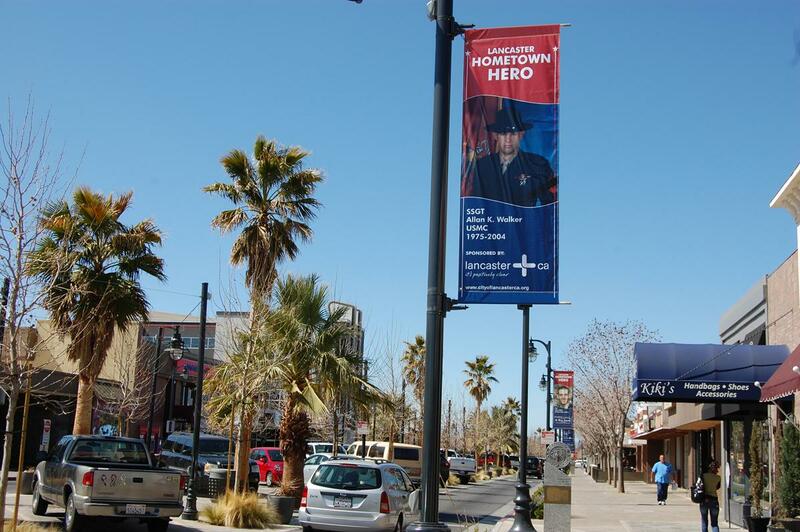 The city of Lancaster is currently accepting nominations for its “Hometown Hero Banner Program.” The banners are attached to light poles along The BLVD, between Beech Avenue and Genoa Avenue. The banners feature Antelope Valley residents who have served in a combat theater during a time of war, between World War I to present, including: World War I, World War II, Vietnam War, Korean War, Gulf War and the current War on Terror. Nominees for the banner program must have lived in the Antelope Valley for at least two years, and if no longer in the service, they must have been honorably discharged. For a nomination form and rules regarding the selection process, visit www.cityoflancasterca.org/hometownhero. Nominations are due by Friday, March 14. Applications may be picked up at City Hall or downloaded online at www.cityoflancasterca.org/hometownhero. “The Hometown Heroes Banner Program is a fantastic opportunity for our community to show its support for our local veterans, honoring them for their service to our nation,” said Mayor R. Rex Parris in a press statement. The city of Lancaster first launched The BLVD Community Program in November 2010, offering residents and business owners the opportunity to make a piece of the revitalized BLVD their very own. Realizing that banners could be used for much more than festive holiday décor, the city developed the “Hometown Hero Banner Program,” providing a special tribute to our local servicemen and women. Banner sponsorships are also available, providing an opportunity for companies to honor local service men and women, while advertising their business. The year-long marketing opportunity costs $100 a month, with discounts available when purchasing four or more banner sponsorships. For more information on nominations or sponsorship opportunities for the Hometown Hero Banner Program, contact the city’s Parks, Recreation and Arts Department at 661-723-6077. 4 comments for "Hometown Hero Banner Program taking nominations"
Thank you to the City of Lancaster for doing this wonderful honoring of our hero’s. I love walking down the blvd and seeing these banners. Does Richard know that the tea party republicans voted to cut food stamps and that many military families need them to eat well? And the down sizing of the military, cuts in pay and benefits are all going to help those same military families. Food stamp expenditures have increased substantially under the current administration. The so called “cut” you must be referring to would be the returning to the amount received prior to a TEMPORARY increase back in 2009. Now back to the topic at hand……. Thank you to all our service men and women and their families for the sacrifices they have made. You are greatly appreciated! To ALL our men and women in uniform. God Bless and Thank you! We can never thank you enough for the enormous sacrifices you have made.